A report released today by New York State Sen. Jeff Klein discusses the economic benefits of raising the New York state minimum wage to $8.50 per hour, and indexing it to inflation thereafter. This would put New York in line with 19 other states with minimum wages above the federal minimum, and 10 other states that have some form of minimum-wage indexing. 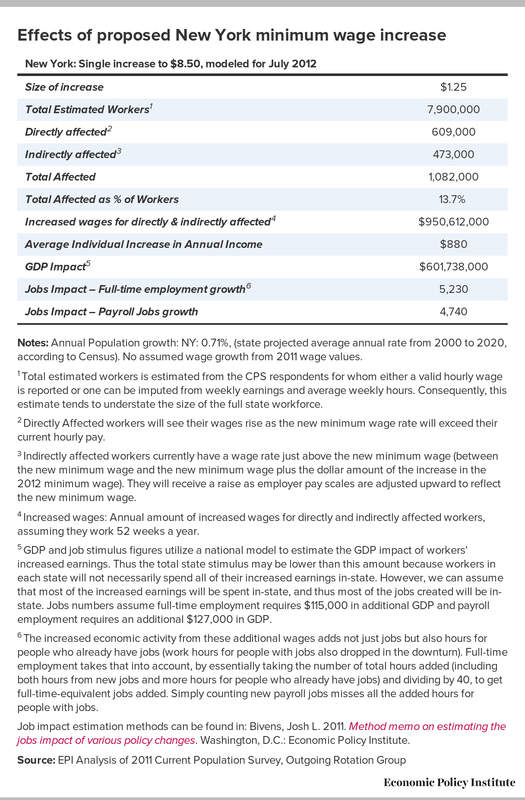 As we have done for other proposals to raise state minimum wages, we calculated the number of people who would be affected by the New York State proposal, and the increase in economic activity that would result from this pay raise for low-wage workers. The table below outlines the results. Roughly 609,000 minimum-wage workers in New York would directly get a raise, while another 473,000 who currently have wages just above the proposed new minimum would also see a wage increase due to “spillover” effects as employers adjust overall pay structures to reflect the new minimum. On average, affected workers in New York would receive an additional $880 over the course of a year. That may not seem like a lot, but it translates into an estimated $600 million in additional economic activity, and that increased economic activity means more jobs. In the table, the final two rows model what we might expect in increased employment as a result of this boost to regional economic activity, after controlling for any decrease in corporate profits. New York stands to gain about 4,700 payroll jobs, or about 5,200 full-time equivalent jobs (essentially accounting for the additional hours that some currently employed workers will receive). Obviously, these job numbers will not be a silver bullet for solving any state’s employment problems, but an additional several thousand jobs—at no added cost to state budgets—certainly would help. The country as a whole has seen flat wage growth over the past four years as high unemployment levels have put tremendous downward pressure on wages. This lagging wage growth, combined with the fact that the federal minimum wage is now only 79 percent of what it was in 1968, means that low-wage workers nationwide could desperately use an increase in the wage floor. Given that Congress is unlikely to enact proposals to raise the federal minimum anytime soon, it’s encouraging to see states like New York taking steps to help low-wage workers on their own. Notes: Annual Population growth: NY: 0.71%, (state projected average annual rate from 2000 to 2020, according to Census). No assumed wage growth from 2011 wage values. 1 Total estimated workers is estimated from the CPS respondents for whom either a valid hourly wage is reported or one can be imputed from weekly earnings and average weekly hours. Consequently, this estimate tends to understate the size of the full state workforce. 2 Directly Affected workers will see their wages rise as the new minimum wage rate will exceed their current hourly pay. 3 Indirectly affected workers currently have a wage rate just above the new minimum wage (between the new minimum wage and the new minimum wage plus the dollar amount of the increase in the 2012 minimum wage). They will receive a raise as employer pay scales are adjusted upward to reflect the new minimum wage. 4 Increased wages: Annual amount of increased wages for directly and indirectly affected workers, assuming they work 52 weeks a year. 5 GDP and job stimulus figures utilize a national model to estimate the GDP impact of workers' increased earnings. Thus the total state stimulus may be lower than this amount because workers in each state will not necessarily spend all of their increased earnings in-state. However, we can assume that most of the increased earnings will be spent in-state, and thus most of the jobs created will be in-state. Jobs numbers assume full-time employment requires $115,000 in additional GDP and payroll employment requires an additional $127,000 in GDP. 6 The increased economic activity from these additional wages adds not just jobs but also hours for people who already have jobs (work hours for people with jobs also dropped in the downturn). Full-time employment takes that into account, by essentially taking the number of total hours added (including both hours from new jobs and more hours for people who already have jobs) and dividing by 40, to get full-time-equivalent jobs added. Simply counting new payroll jobs misses all the added hours for people with jobs. Job impact estimation methods can be found in: Bivens, Josh L. 2011. Method memo on estimating the jobs impact of various policy changes. Washington, D.C.: Economic Policy Institute.